Anaerobic Adhesives are single component engineering adhesives that harden only in the absence of air. This property makes it an ideal product for use in engineering industries. Our product range includes Thread locker, Bearing Retainer, Liquid Gasket, Pipe Sealing and Micro encapsulated Pre coating Systems. 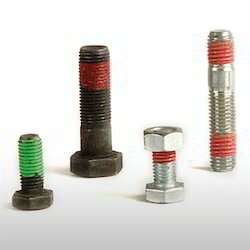 They find application in nuts, bolts, studs and threaded screws. 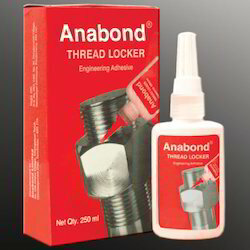 Anabond Microloc is a thread locking and sealing system wherein, adhesives are encapsulated into microcapsules of 10 to 100 microns. These microcapsules are supplied in a dried powder form (Part-A). Just before usage, take the Anabond Mircoloc powder (Part A ) and add solvent (Part B) to it (Keep and use in a well ventilated area, away from flames, Sparks etc). Start gently stirring with a plastic or wooden ladle, until a homogeneous dispersion is obtained. Adjust the viscosity with more or less solvent that will be convenient to coat (If the mixing ratio recommended by the company is not suitable for your application) slight variations in solvent content will not affect the performance.Apply this mixture on to the threads by any suitable means like brush, roller, manual or automatic applicators. Dry out the solvent by natural evaporation at room temperature (25 to 40°C) for 30 minutes (hot air oven drying is not recommended due to flammability hazard). When dry to touch, the fastener is ready for use. 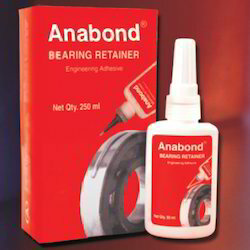 Bearing Retainer are anaerobic adhesive used to retain cylindrical fitted parts. It ensures uniform load distribution and reduces the possibilities of fretting corrosion and loosening in bearings and bushes. 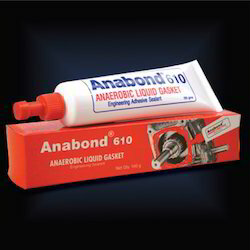 Anabond bearing retainers are also used for its leak proof sealing applications in core plugs. This adhesive finds application in core plugs, gears, shafts, bushes and splines. We offer Anabond Bearing retainers at reasonable prices. Splines, shafts, gears, cup plugs etc. We offer good quality anaerobic Pipe Sealing Sealant. It is basically used in threaded joints of pneumatic/hydraulic machines and pipelines. 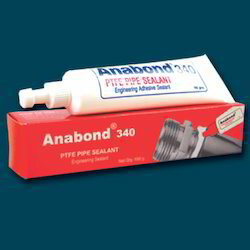 Anabond Pipe sealant finds application in refineries, pharmaceutical industries, beverage and chemical industries. Liquid Gasket Sealants of the anaerobic variety are engineering sealants used to seal machnined flange joints in machinery and piping joints. They are available in thixotropic paste form for better gap filling properties. We offer liquid gaskets at cost effective prices. They are highly resistant to most chemical, oil and fuels encountered in engineering industries. Looking for Anaerobic Adhesive ?